STAY AHEAD OF THE GAME WITH AORUS Gigabyte’s Z390 AORUS MASTER Gaming motherboard is perfect for every PC enthusiast and is packed full of intuitive technology that offers the best performance, audio and customization options. Sync RGB LED strips using the RGB Fusion software, which allows users to control both on-board and external lighting on their system. 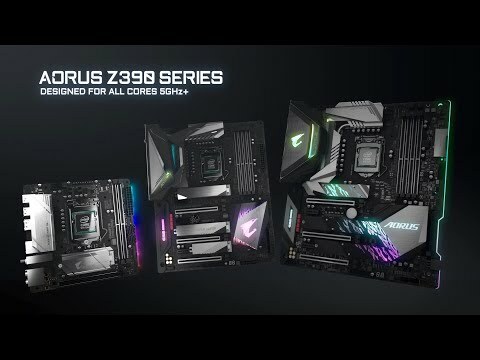 The Z390 AORUS MASTER is formed on the Intel Z390 chipset and is reinforced with ultra-durable components featuring Dual-Channel DDR4 for exceptional memory speed whilst Triple M.2 Connectors with efficient thermal guards work to keep your SSD devices running at their absolute best. EXPERIENCE THE ULTIMATE POWER The Z390 AORUS MASTER motherboard uses an all IR 12 phase digital CPU power design which includes both digital PWM Controller and PowlRstage MOSFET. These 100% digital controller and additional 8+8 Solid-pin CPU Power Connectors deliver incredible precision in delivering power to the motherboard's most power-hungry and energy-sensitive components, giving gamers the maximum performance from the new 9th Generation Intel Core processors. A PERFECT BALANCE OF STYLE AND PERFORMANCE The Z390 AORUS MASTER utilizes Fins-Array Heatsink to increase the heat dissipation area by 300% compared to traditional heatsinks to completely keep your components efficiently cooled, with Direct Touch Heatpipe working to help transfer heat from MOS to the heatsink and fins. By using LAIRD 1.5mm thick, 5W/mk high thermal conductivity pads, it can transfer 2.7x more heat compared to traditional thermal pads in the same amount of time, and is all backed up with a thermal baseplate. Z390 AORUS MASTER finds a perfect balance between aesthetics and performance by combining all these features to deliver 30% lower MOSFET temperatures to give enthusiasts, overclockers and professional gamers the best possible experience. 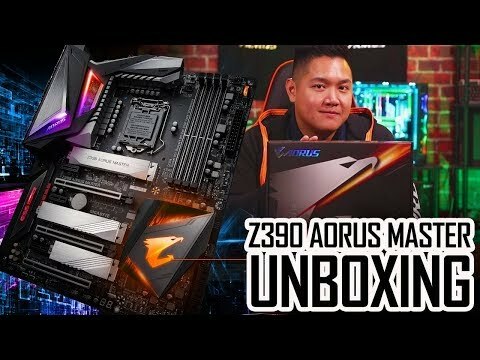 ULTRA-FAST STORAGE WITH THERMAL GUARD Z390 AORUS motherboards offer industry-leading compatibility in terms of NVMe storage for users who demand the best possible storage performance, with AORUS' unique design that can be configured in RAID for record sequential read speeds of up to 3551 MB/s. This makes AORUS the ultimate choice for a fantastic system. Gigabyte also provides a thermal solution for your M.2 SSD devices, with the M.2 Thermal Guard working to dissipate heat to prevent throttling and bottlenecks from high-speed M.2 SSDs. MEMORY SPEEDS UP TO 4400MHz AORUS offers a tested and proven platform that ensures proper compatibility with profiles up to 4400MHz and beyond. All you need to do to attain the impressive performance boost is ensure that your memory module is XMP capable and that the XMP function is activated and enabled on your AORUS motherboard. DDR4 memory modules are available at a stock frequency of 2133MHz. Frequency tweaking requires a considerable amount of effort and knowledge, so memory vendors encode XMP profiles that can automatically modify the timings of the supported memory modules to work with your CPU for greater performance. INTEL ® WI-FI AC & BLUETOOTH The Z390 AORUS MASTER offers amazing connectivity features to give you the best signal for uninterrupted gameplay. With Intel® GbE LAN features cFosSpeed, a network traffic management application which works to improve network latency and maintain low ping times to deliver improved responsiveness in crowded LAN environments. With speeds up to 1.73Gbps, Intel Next-Gen Wireless solution supports 802.11ac Wave 2 function and gigabit wireless performance to provide ultra-smooth video streaming, few dropped connections and an improved gaming experience. This is double the speed compared to the previous generation. Moreover, Bluetooth 5 delivers 4x range over BT4.2 and with even faster transmission. ENHANCED PERFORMANCE WITH OPTANE MEMORY The Z390 AORUS MASTER supports Intel's latest Optane technology. Optane fuels storage performance by acting as a cache drive giving users a significant boost compared to traditional mechanical drives. USB Type-C™ Front Panel Connector The Z390 AORUS MASTER comes equipped with next generation connectivity, with connectors that will benefit you even in the future. The on-board USB Type-C™ header for USB 3.2 Gen2 makes access easy when connecting a USB 3.1 Gen2 drive or charging your smartphone. CUSTOMIZE LIGHTING TO FIT YOUR STYLE RGB Fusion is a smart software that lets you configure on-board and external RGB lighting on your system with a wealth of colours and up to 12 lighting effects. With more LED customizations than ever, you can truly adapt your PC to your style and even connect and control LED light strips. Featuring full RGB support and a revamped RGB Fusion application, you'll gain complete control over the vibrant lighting on your motherboard. The AORUS Z390 supports either 5v or 12v LED lighting strips and up to 300 LED lights. RGB Fusion APPThe GIGABYTE RGB Fusion mobile app users can watch as they control the lighting within their gaming PC. AORUS SMART FAN 5 The Smart Fan 5 software ensures that your system can maintain its performance whilst staying cool, allowing you to interchange the fan headers to reflect different thermal sensors on your motherboard. 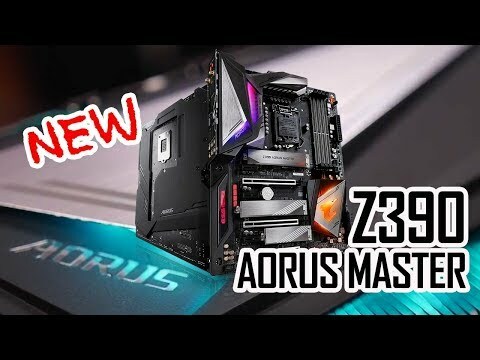 More hybrid fan headers that support both PWM and Voltage mode fans have been introduced to make the Z390 AORUS MASTER even more versatile when it comes to air and liquid cooling. For each fan or pump, you can use the intuitive fan curve to define trigger thresholds and corresponding fan speeds, and with Fan Stop you can map any fan to stop completely when temperatures drop below a specified threshold for silent performance. All New Realtek High-End HD Audio Codec ALC1220 120dB(A) SNR HD Audio with Smart Headphone Amp automatically detects impedance of your head-worn audio device, preventing issues such as low volume and distortion. With the new VB series audio controller, stream your voice to the world vibrantly with both front/rear microphone SNR up to 110/114dB. The AORUS motherboards boast a combination of Audiophile grade WIMA and Nichicon Fine Gold capacitors which are suited for high-grade audio equipment, using state of the art technology to provide rich sound in the bass and clearer high frequencies. USB DAC-UP 2 continues to provide clean, isolated and low-noise power while adding the ability to compensate for voltage drop. AORUS EXCELLENCE Optimise and improve your connection with WTFast, the Gamers Private Network (GPN). Cast your game anywhere and experience the greatest gaming moments with XSplit Gamecaster + Broadcaster. Host your game like a pro and with just one click stream your gameplay to Twitch, chat to fellow gamers and interact with social media integration. Gigabyte Z390 AORUS MASTER, Intel Z390, S 1151, DDR4, SATA3, Triple M.2, 2-Way SLi/3-WayCrossFire, WiFi, USB3.1 A+C, ATX is rated 4.5 out of 5 by 2.